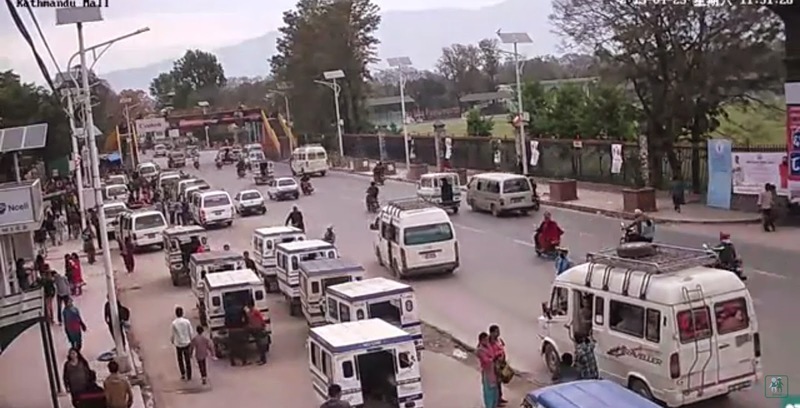 Image captured from video posted by Setopati Online on YouTube. A video has emerged on YouTube showing CCTV footage of a Kathmandu thoroughfare just as the killer magnitude 7.8 hit the Nepali capital city. The death toll from the quake that struck the Himalayan nation on 25 April 2015 has risen to 5489 people as of the writing of this article. The video shows business as usual on the Kathmandu street until the CCTV camera started to gradually then violently shake. As the quake became stronger, people began to scamper out of buildings an vehicular traffic turned into mayhem. Warning: the video contains graphic images. Video posted by Setopati Online on Youtube.